So, we’ve been rather busy in Logan office, putting together our collections for next Summer (2018-19). Whilst it still seems quite some time away (and this summer feels like it’s just beginning) our Winter 2018 stock is already about to hit retail stores. The design process to put together a collection (and prototypes) usually takes 3-4 months – so it’s always great to see how everything has come together! Our design team work incredibly hard to present comprehensive collections that reflect our classic heritage, whilst introducing new seasonal colours and styles that will refresh & update your wardrobe. 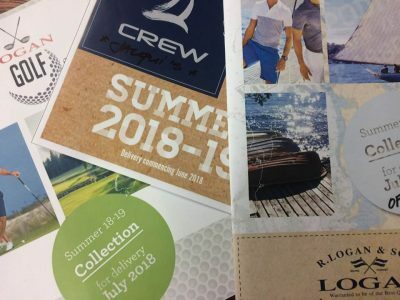 We enjoyed revisiting older style books and finding favourite items and fabrications to re-introduce our younger range Logan Crew & expand our Logan Golf ranges. It’s always a mix of emotions waiting for the sales team to get back from their meetings with buyers, but we anticipate good things for the year ahead. We’re also pleased to be able to open our Outlet Store here on the website, for a limited time. We’ll release one additional style available for purchase each day, along with free shipping to NZ addresses, through till Friday 15th December. Just in time to grab a Christmas presents that can be sent directly to your door. Check here www.logan.co.nz/shop to view the selected range of Polo’s and Shirt’s we have available.